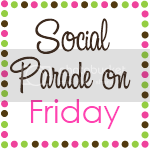 "It's a Social Parade Friday!" Are there things that happen in your everyday life that make you smile or even laugh out loud? It happens daily to me and I always think to myself, "I should blog about that." But then life moves on and by the time I sit down at my computer the thought is gone. Well, let's be honest. As soon as my smile fades, the thought is gone. Sometimes I swear there's a giant eraser in my brain. Once I tell myself to make a mental note, that eraser wipes it right away! Oh well, today I have had several of these funny little thoughts that I HAVE remembered, so let's see if I can hold onto them just long enough to get them all in this post! My Christmas cactus has NEVER bloomed at Christmas! It starts blooming around Thanksgiving and the flowers hang on until about a week before Christmas and then they are gone! I call it my Thanksgiving cactus. After I eat a bowl of my white chocolate snack mix, I look down and it's like an M&Ms graveyard. In this mix is the only time I don't enjoy M&Ms! You just gotta shake your head and laugh...and not buy expensive tights because this happens more often than I should admit! I called my mom today and she was baking Christmas cookies with my nephew because his school was closed due to snow. This reminded me so much of all the times she baked Christmas cookies with my sisters and me. It makes me happy to know that she's passing those traditions on to the next generation. And my dad is happy because he still taste-tests each batch claiming it's his favorite kind of cookie! My only Christmas decoration currently up is the lovely wreath my boss gave me...it's outside where I NEVER see it. Shouldn't I put it somewhere that I can see and enjoy it? Oh well, enjoy neighbors! I think I had a couple of more things to talk about but that darn eraser got to them before I could...maybe next time. Love the randomness! And the pic of the toes!!! Oooh! Good tip Ann! I HATE holes in my socks and refuse to wear them afterward, and don't even start with me about darning them. I "DARN!" them all the time! ;-) Actually we (Mom and I) used to try and darn them, but the quality of socks, just are nto what they used to be, and the end result was usually a blister or sore spot where the repair wore on the foot. Time for a donation to the Sock puppet cause! Happy holidays! I’ve been following your neat blog from Social Parade/Follow on Fridays blog hop. My Facebook page “Inspire” has inspiring messages. Stop by! I'm pretty sure one of those gigantic erasers is in my brain too! As for the cactus, I'm one of the few people in the world that can kill a cactus. I'm impressed yours blooms at all! your stocking feet look much like mine after a long day! !